It was perhaps to be expected that even in the short time between the last possibility of making corrections and additions and the actual publication of my catalogue of The Paintings and Drawings of William Blake, there would be changes of ownership and new discoveries. Given that this had to happen, it is gratifying that the Tate Gallery is the beneficiary in both respects. The delicate pencil and watercolor sketch for the alternative composition of “‘Every Man also gave him a Piece of Money’” has led a checkered career since it was sold from the collection of Kerrison Preston at Sotheby’s in 1974. Bought by Colnaghi’s and included in their exhibition of English Drawings, Watercolours and Paintings in 1976, it was stolen only to be recovered two years later in a veritable Aladdin’s Cave of stolen works of art. The drawing had been acquired by Kerrison Preston at the sale of the famous Blake collection of W. Graham Robertson and its history before that can be traced, with near certainty, back to Frederick Tatham and Blake’s widow. However, this good and exciting history seems not to have enhanced its interest; the work failed to attract a single bid when offered again at Sotheby’s in 1979. It was at this point in its history that it was recorded in my catalogue, somewhat disingenuously, as being in a “Private Collection, Great Britain.”1↤ 1 Martin Butlin, The Paintings and Drawings of William Blake, 1981, I, 423-24 no. 553, reproduced in color, II pl. 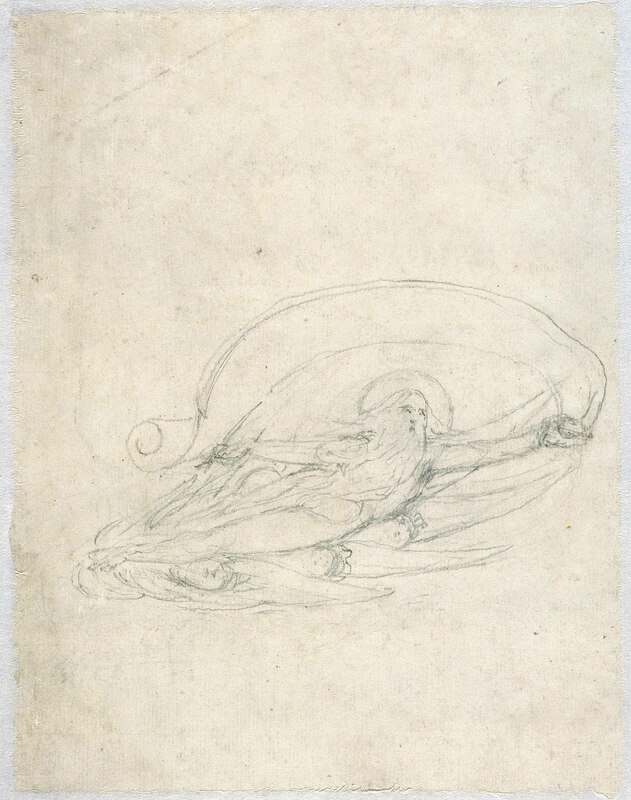 718; re-examination under ideal conditions in the Tate Gallery Conservation Department has revealed that Blake began to reinforce some of the outlines in pen, and has also slightly modified the dimensions which should read. “framing line 8 × 7 (22.8 × 17.8) on paper 9 ½ × 7 ½ (24.2 × 19).” Thanks to the help of Mr. James Miller of Sotheby’s, the sketch has now been bought by the Friends of the Tate Gallery for presentation to the Tate. Considerably improved in appearance by conservation treatment, it is now on view in the Tate’s Blake gallery, hanging with the companion watercolor of “Job and his Daughters” on long loan to the Tate from Dr. R. E. Hemphill;2↤ 2 Butlin no. 556, repr. pl. 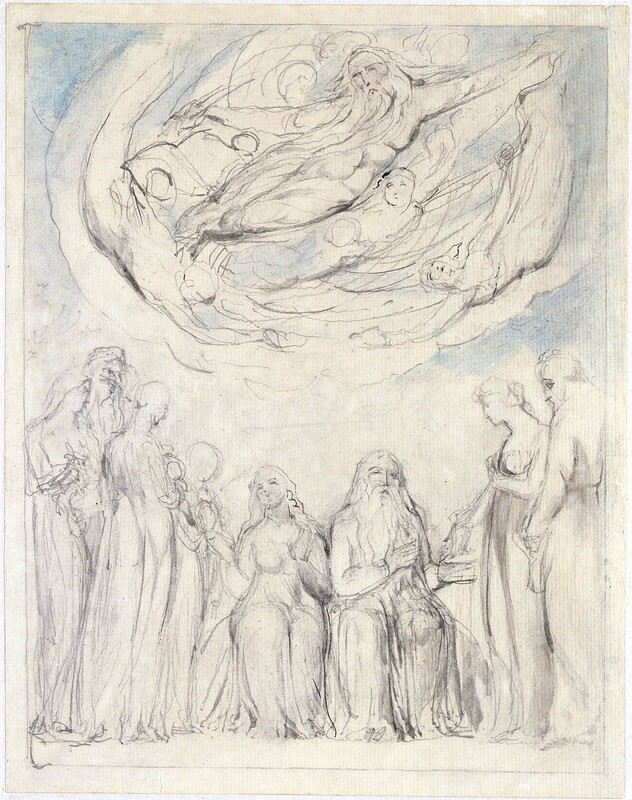 757. both works were executed in the early 1820s at the time when Blake was repeating his series of Job watercolors for John Linnell and preparing the engravings from them. However, in addition to improving the sketch’s appearance conservation treatment has also revealed a hitherto unknown pencil sketch on the back. This, measuring about 3 ¼ × 6 in. (9.5 × 15 cm. ), is a variant of the group on the recto of God the Father and attendant angels. God the Father is shown holding a scroll that forms a great arc above his head, and the number of supporting angels is reduced. Altogether the group lacks the dynamic centrifugal force of the recto and of subsequent developments to be seen in the pen and wash drawing in the British Museum and the pencil sketch in the Fitzwilliam Museum sketchbook.3↤ 3 Butlin nos. 554 and 55743, repr. pls. 755 and 779. The group of figures is placed relatively low on the paper which suggests that this is an alternative try-out for the group by itself rather than the beginning of an alternative sketch for the whole design with figures below. One mystery remains. Graham Robertson, as reported by Kerrison Preston,4↤ 4 Kerrison Preston, The Blake Collection of W. Graham Robertson described by the Collector, 1952, p. 138 no. 50. states that “behind the earthly group the sky glows faintly with tender gold and rose, till rising higher it frames the Angelic Vision in softest blue.” Only the blue can now be seen and not even a trace of the tender gold and rose could be detected by the Tate’s Conservation Department. Similarly with “Job and his Daughters” in which Graham Robertson described the colors of the figures as follows: “The maiden on his [Job’s] left is robed in pale pink, she on his right in yellow, while the third, who sits facing him upon the ground, is in palest blue.”5↤ 5 Preston, p. 140 no. 51. Again only the blue can be seen. However, in the third of the group, “Job’s Sacrifice,”6↤ 6 Preston, p. 136 no. 49; Butlin p. 423 no. 552. most of the colors described by Graham Robertson can still be discerned, as has been kindly confirmed by Miss Miranda Strickland-Constable and Mr. Alexander W. Robertson of the City Art Gallery, Leeds. Blue is usually the first color to fade from Blake watercolors, so the presence of this color and the absence of those described by Graham Robertson in the first two watercolors is all the more mysterious. While updating my catalogue I should perhaps point out that three names of owners, if not more, are missing from the general index: Besterman, Dr. Theodore, for catalogue nos. 119 and 179A; Bindman, David, for nos. 147 and 232, with an indirect reference under no. 152; and Clayton-Stamm, M. D. E., for no. 692. I should be most grateful for any further errors or omissions to be pointed out to me; obviously, if they are of importance, they should be published in Blake/An Illustrated Quarterly. 1 “Every Man also gave him a Piece of Money,” c. 1821-3. Pencil, pen, and watercolor, 22.8 × 17.8 cm. Tate Gallery. 2 “God the Father with Attendant Angels,” verso of “Every Man also gave him a Piece of Money,” c. 1821-3. Pencil, approx. 9.5 × 15 cm. Tate Gallery.